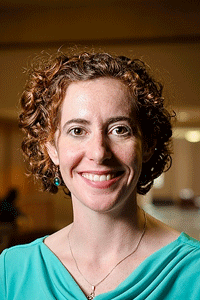 Professor Laura Albert’s research focuses on modeling and solving real-world discrete optimization problems with application to homeland security, disasters, public services, and healthcare. President-Elect/President/Past-President, INFORMS Section on Public Programs, Service and Needs (SPPSN), 2013 – 2015. President-Elect/President/Past-President, Women in OR/MS (WORMS), a forum of INFORMS, 2012 – 2014. Member of the Doing Good with Good O.R. Committee, INFORMS, 2012 – 2014, and co-chair of the committee in 2013. Cluster chair for the Healthcare systems/Informatics, INFORMS Annual Meeting, October 6-9, 2013, Minneapolis, MN. Member of the INFORMS nominating committee, 2013. Member of the IT committee, INFORMS, 2011 – 2012. Cluster chair, Women in OR/MS (WORMS), 2012 INFORMS Annual Meeting, Phoenix, AZ, October 2012. Vice-President of Communications, INFORMS Section on Public Programs, Service and Needs (SPPSN), 2010 – 2012. Vice-President of Meetings, Women in OR/MS (WORMS), a forum of INFORMS, 2008-2010. Young Investigator Award, Department of the Army-Materiel Command, Army Research Office, 2010. Operations Research Challenge Competition Winner, First Symposium on Operations Research and the Criminal Justice System, US National Institute of Justice 2006. INFORMS Computing Society Student Paper Competition, Runner-up, 2006. Fellow, National Science Foundation, Enabling the Next Generation of Hazards and Disasters Researchers Fellows Program, 2009. Outstanding IIE Publication Award (with Sheldon H. Jacobson), 2009. Best paper award, 2009 Industrial Engineering Research Conference, Operations Research track (with Sunarin Chanta, Maria Mayorga, and Margaret Wiecek), 2009. Achievement Award Winner for Next-Generation Emergency Medical Response Through Data Analysis & Planning (Best in Category winner, as part of the Hanover County Fire & EMS team), National Association of Counties, 2010. Excellence in Scholarship Award, College of Humanities and Sciences, Virginia Commonwealth University, 2012. Best paper award from Risk Analysis, Society of Risk Analysis (with Casey Rothschild and Seth Guikema), 2012. Dreiding, R.A., McLay, L.A., 2013. An Integrated Screening Model for Screening Cargo Containers for Nuclear Weapons. European Journal of Operational Research 230, 181 – 189. McLay, L.A., Mayorga, M.E., 2013. A model for optimally dispatching ambulances to emergency calls with classification errors in patient priorities. IIE Transactions 45(1), 1—24. McLay, L.A., Mayorga, M.E., 2013. A dispatching model for server-to-customer systems that balances efficiency and equity. To appear in Manufacturing & Service Operations Management, doi:10.1287/msom.1120.0411. Chanta, S., Mayorga, M. E., McLay, L. A., 2013. Improving Rural Emergency Services without Sacrificing Coverage: A Bi-Objective Covering Location Model for EMS Systems. To appear inAnnals of Operations Research.